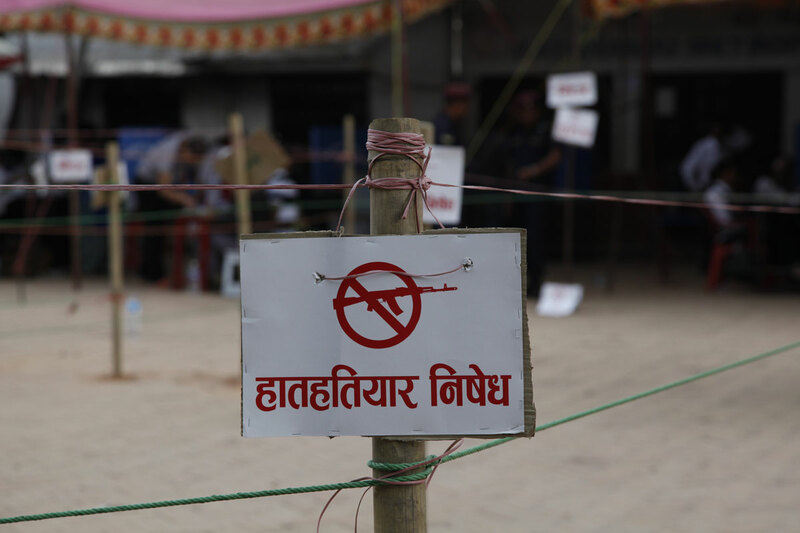 This Sunday, people were voting in Kathmandu. Here, on election days, to ensure the process is peaceful and democratic, all car traffic is banned and the sale of alcohol is suspended. Also, around the polling stations, there are signs reminding you that it is strictly forbidden to carry a gun in the vicinity. In Darjeeling and Nepal, you cannot trust the name of a garden blindly. Of course, plantations such as Turzum, Singbulli, Puttabong, Thurbo, Margaret’s Hope and Castleton have a much higher reputation than others. The same goes for Guranse and Shangri La in Nepal. But it is essential to understand that even the most prestigious gardens cannot produce high-quality teas all the time. At some point in the year they end up selling pretty nondescript ones. During the rainy season, for example, even an experienced planter cannot produce good tea, because the leaves grow too quickly and have no time to develop their essential oils. Also, each plantation has plots that are more or less well oriented, and planted with different cultivars. On Monday you might produce a sublime tea using leaves harvested from an excellent plot, and on Tuesday produce a very ordinary tea from a different part of the plantation. To sum up: yes, some gardens can make remarkable teas, but watch out, as they also produce mediocre ones. So you have to be very selective, and taste a vast amount of tea, to be able to recognise the best. 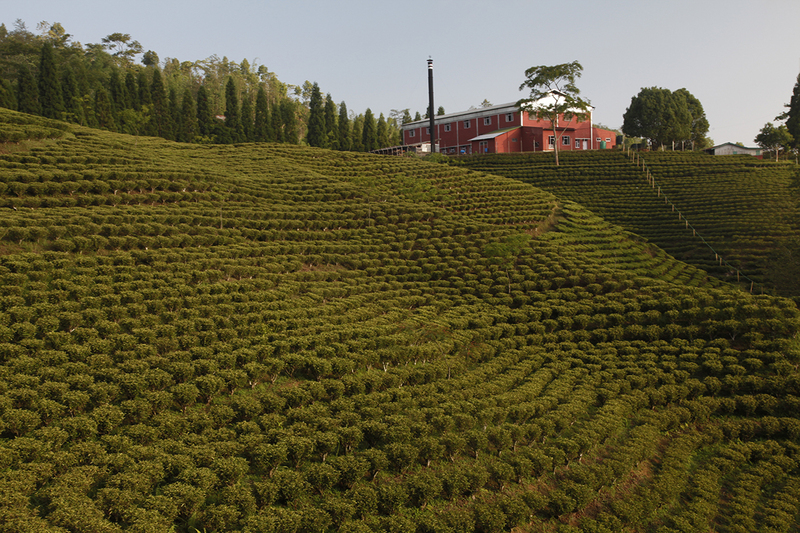 Some tea plantations have rather ordinary origins, and the Kuwapani plantation is one of them. A few years ago there was a rundown angora rabbit farm in Kuwapani that was only just limping along. I’m talking about the farm but I’m sure the same could have been said for the poor rabbits, bred for their fur alone. 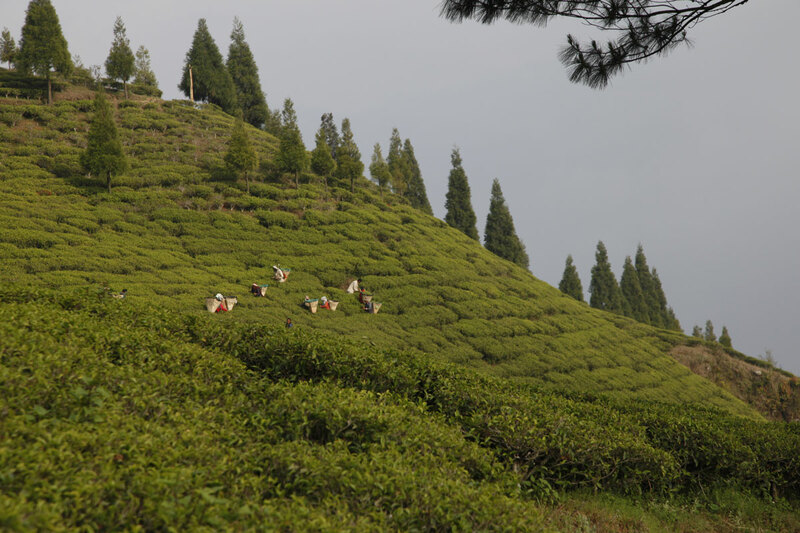 The owner saw a tea plantation being established on the hill opposite, followed by another. He observed the harvesting and processing of the leaves. He developed a taste for what his neighbours, Jun Chiyabari and Guranse, produced, and he witnessed their growing success. Then, one day, he decided to change his business, radically. He opened up the hutches, installed machines in his main building to process the tea leaves (rollers, dryers and so on), planted his land with tea, recruited an experienced, talented man to oversee the work, and a few years later the Kuwapani plantation had made its name in the world of tea. I heard this story while I was staying at Kuwapani and asked the owner about an object that had been intriguing me. On the mantelpiece in the living room sits a magnificent porcelain rabbit. It’s more than a year since Nepal was hit by a powerful earthquake. And since then, for many villagers, life has not improved. In this country that is very rural and particularly mountainous, the aid they were promised has not been forthcoming. 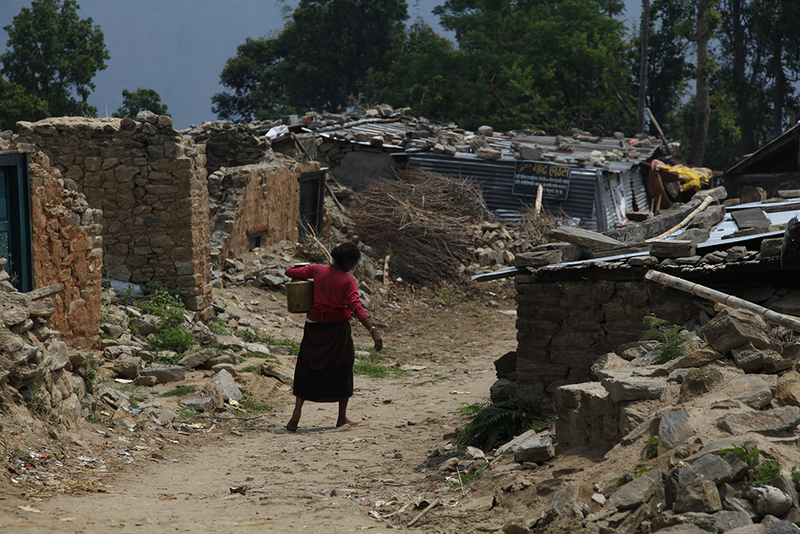 Many people are living in their houses as before: they have placed a makeshift roof over the ruins, and life goes on. But what will happen to them after the monsoon, what will they have left after the rainy season that turns everything into mud? 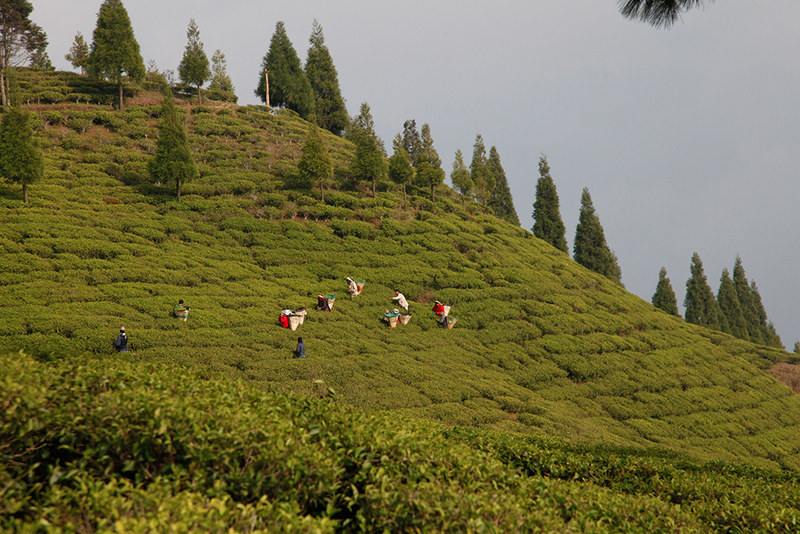 After Darjeeling, we turn our attention to Nepal, China and Japan, to enjoy their new spring teas. In Japan, we return to the farmers we know, and we also enjoy discovering teas from others. 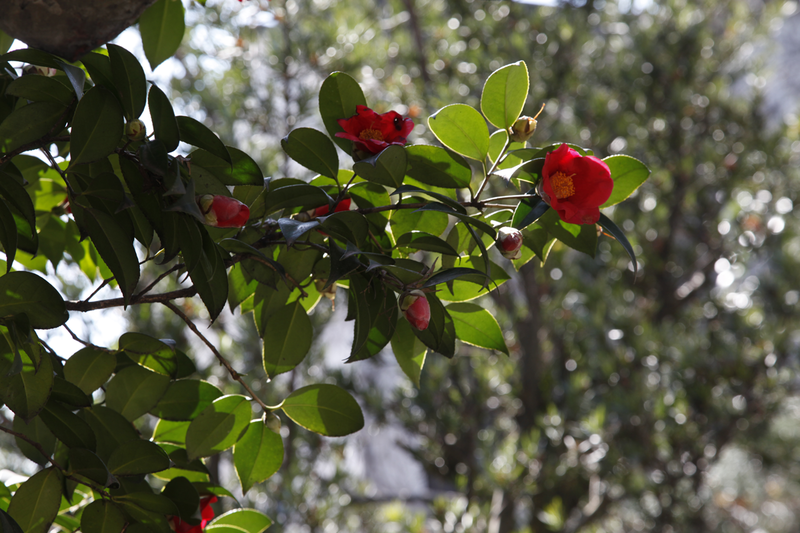 In China, we are guided by the traditional appellations, which are attached to a particular village. 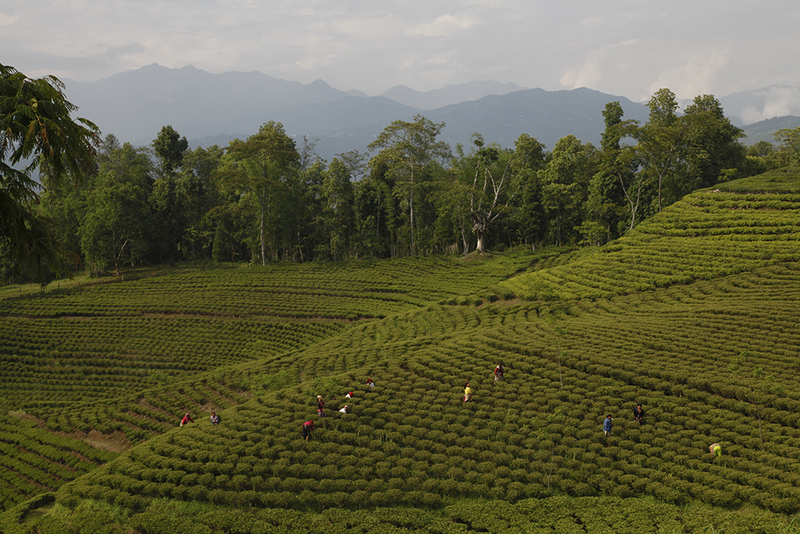 In Nepal, we know which plantations are capable of producing the best teas at particular times of year. There is sometimes an added difficulty though, like here at Kuwapani. The planter, who was an employee rather than the owner of the plantation, has left. What will the results be like under his successor? We’ll know the answer in a few months’ time. Meanwhile, let’s enjoy tasting the new teas this spring has to offer! Due to a way of thinking I don’t share, Darjeeling tea producers fear competition from their Nepalese neighbours. They think the latter are copying them and can sell their teas more cheaply, because of their lower production costs. Yes, Nepalese teas sometimes offer good value for money, but they are not copies of Darjeelings. There are some passionate planters in Nepal who know that their country still needs to prove itself to gain recognition in the world of tea, and as a result, they try to be innovative. In Darjeeling, planters are in a more comfortable position due to their reputation that is often – but not always – merited. So, they are two different worlds: innovation on one side, tradition on the other. By looking carefully and being highly selective, you can find excellent teas on both sides of the border. And it would be a shame to deprive yourself of either kind. You can say what you like, I remain convinced that education is the key to a society where everyone lives together in harmony. The key to equal opportunities. When I travel through the tea fields, I never miss an opportunity to visit the village school, to chat with the students and the teachers. This man dressed in red with a basket on his back, do you recognise him? 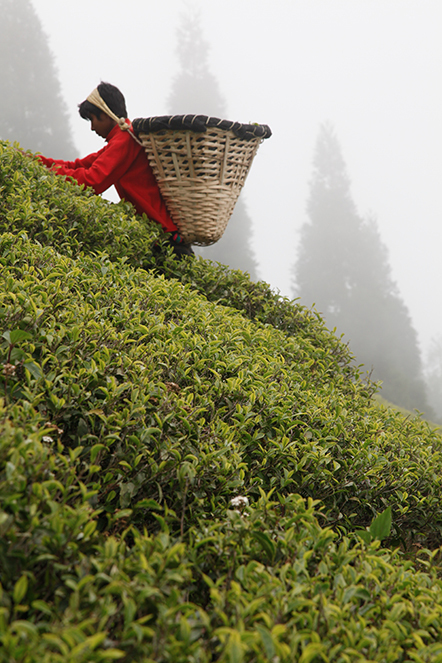 He is filling his basket with the greatest care, delicately picking the best tea shoots, for you. A few fir trees can be seen through the mist. I hope that, at the bottom of your tree, in a few days’ time, he will place the finest teas in the world. Looking at the liquor is one of the first steps in tea tasting. While the temperature of the cup slowly falls, we pay attention to the colour of the liquid. Green tea produces something pale, while black tea gives a more coppery tone. This does not mean darker tea has been infused for longer, or has a more pronounced fragrance than its neighbour. In fact there are green teas that have a remarkably powerful aroma, even after quite a short infusion. 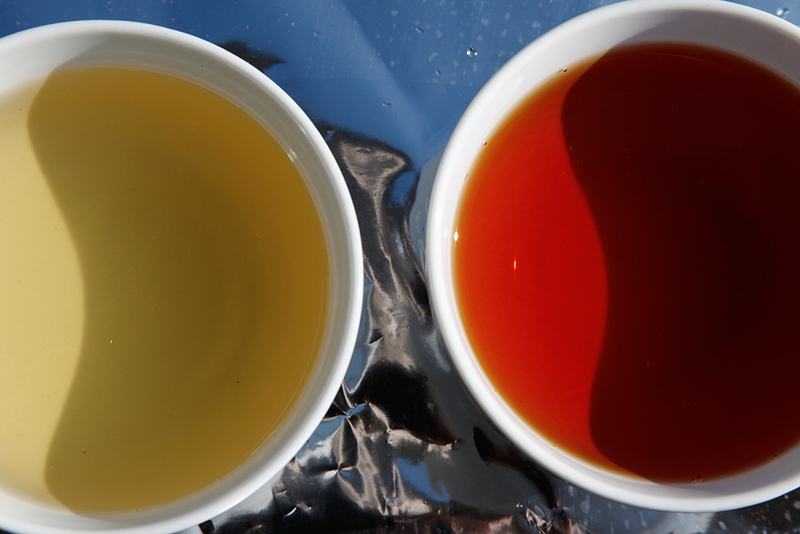 So we cannot conclude from this photo that the most aromatic tea will be the more coloured of the two.